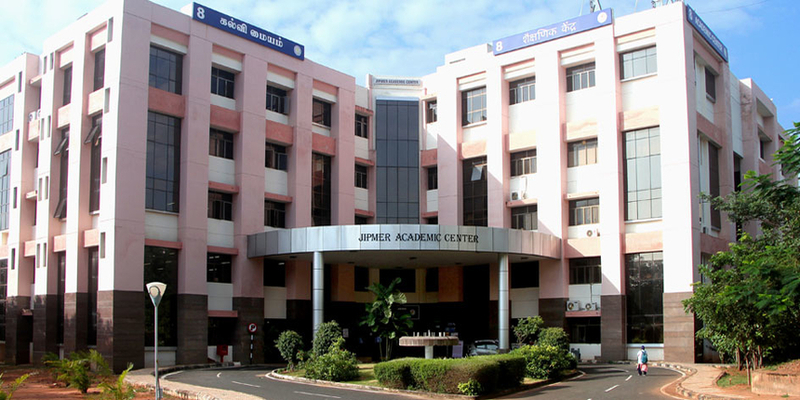 JIPMER Counselling 2019 - Jawaharlal Institute of Medical Education and Research (JIPMER) Puducherry will start the JIPMER 2019 counselling on June 26. The counselling of JIPMER 2019 will be only conducted in offline mode meaning aspirants will be required to report to the counselling venue with all the mandatory documents. JIPMER Puducherry will be conducting three rounds of JIPMER counselling 2019 and an additional open round for which all the candidates who have qualified the exam will be invited. Note that only the qualified candidates will be called for the JIPMER 2019 counselling. Before starting a counselling round, authorities will be releasing an official notice disclosing the ranks of the candidates who are invited for the counselling of JIPMER 2019 and the documents that are required for the same. This article will familiarise candidates with the JIPMER 2019 counselling process, important dates, JIPMER cut off, statistics and admission procedure, etc. The conducting body of JIPMER counselling 2019 will hold the first round between June 26 and June 28, 2019. Candidates who will be absent in any of the round of counselling will be declared ineligible for the next round of JIPMER 2019 counselling as well except for the open round. For each round of counselling, the number of candidates will be eight times the number of seats available. JIPMER will conduct the counselling process for 150 seats available at JIPMER Puducherry and 50 seats available at Karaikal campus. The result of the JIPMER MBBS entrance exam will be released on June 10. JIPMER Puducherry will release an official notice along with the JIPMER result for the counselling. The notice will state the candidates invited for the JIPMER counselling 2019, venue, date and time of the counselling, and documents required. This official notice will not be sent to the individual candidates, candidates can check the same on the official website or in this article. Candidates can check below the stepwise procedure to be followed to participate in the counselling of JIPMER 2019. Candidates who will qualify JIPMER 2019 by clearing the cutoff and are also included in the merit list will need to report to the JIPMER counselling venue at the time and date specified on the official notice. The first step they have to undertake upon reporting at the counselling venue is to register their details. After successful registration, candidates will be asked to verify their fingerprints and photograph before JIPMER 2019 counselling starts. 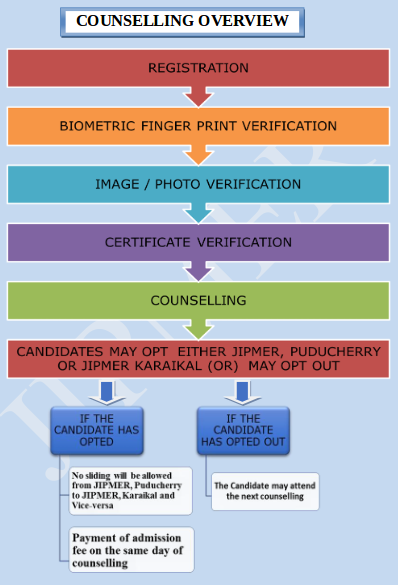 In case there is a mismatch in the biometric fingerprints or photograph then the candidates will not be allowed to take part in the JIPMER counselling 2019 and there are chances that the Institution can take legal action against them. 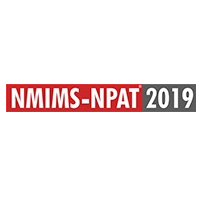 JIPMER 2019 admit card signed by the invigilator or the exam centre representative present during the exam. After the verification of candidates’ documents, biometric and image, candidates will be invited to participate in the counselling of JIPMER 2019. UR and PwD category seats will be filled first for which all the candidates will be called in the order of their merit irrespective of whether they belong to UR, OBC, SC or ST. After the counselling of these seats, candidates belonging to OBC, SC and ST categories will be called to fill up the seats reserved for the respective categories. Next the counselling for seats available for Puducherry candidates will be conducted. 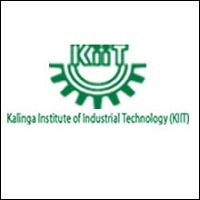 Candidates can choose the campus where they wish to take admission as per their merit rank. Note that authorities will not allow sliding from one campus to the other once a particular campus is selected. The procedure of the second round of JIPMER 2019 counselling will remain same as that of the round one of counselling. The list of candidates invited for the round two of counselling will be released by the authorities. The candidates who will attend the first round of counselling but do not opt for a seat will be eligible to participate in the second round of JIPMER counselling 2019. However, those who are invited for the first round but do not attend the counselling will be declared ineligible for the further counselling rounds except for the open round. The candidates who will not opt for any seat in the second round of counselling will be eligible for the third round of JIPMER counselling 2019. JIPMER Puducherry will conduct the open round of JIPMER counselling 2019 if the seats remain vacant after round three. For the open round of counselling, all the candidates will be invited who have qualified the exam i.e. secured a percentile score equal to or more than the JIPMER cut off 2019. Candidates can check here the ranks of the candidates invited for each round of JIPMER counselling. Note that mere invitation to the counselling process does not guarantee admission. The ratio of the number of seats available and the number of candidates called for JIPMER counselling will be 1:8. The total number of seats available at Puducherry campus is 150 and JIPMER Karaikal is 50. Candidates can check here the seat reservation policy of JIPMER and the criteria to apply for Puducherry residents quota seats. The seats reserved for OPH candidates are not to be counted as extra seats as that is the horizontal reservation. Note that the seat distribution given in the table below is subject to change. Candidate must have a Permanent Integrated Certificate issued by the Department of Revenue & Disaster Management or by the administrative (tehsil/taluk) office concerned. 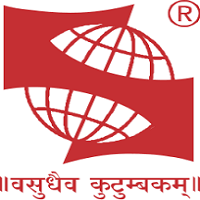 Candidate must have completed Class 10 from the union territory and have also completed five years of continuous study. In this case, it is also required of candidates to be a resident of the Puducherry for five years. Candidate’s parent/s should be an employee of Puducherry Government or Central Government at least for three consecutive years. Candidate, in this case, must have completed Class 12 from an institution located in Puducherry and has studied for two successive years. Candidate whose either of the parent was a Defence Personnel/Central Paramilitary Force killed or disabled in action and who has declared Puducherry as his/her hometown will be eligible.